FOREVER FREEBIE! What is a Multiple Meaning Word? 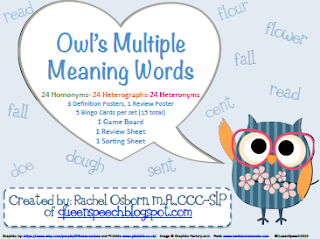 Owl's Multiple Meaning Words-UPDATED 4/21/2013 with MORE content! Skill targeted: Multiple Meaning Words and the different types! 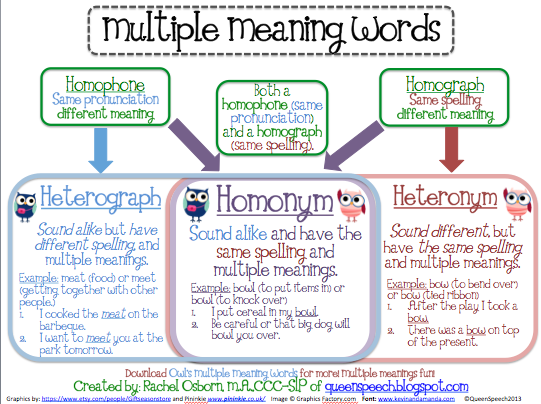 This packet includes both homopohones and homographs and the subclasses: heteronyms, heterographs and homonyms! Other skills: expressive language, semantics (vocabulary building), syntax (when used in sentences). WHAT ARE MULTIPLE MEANING WORDS? Multiple Meaning Words are complicated! This packet will help you and your students understand the different types! Under the multiple meaning "umbrella" are homophones and homographs, break it down further. Their are different types: heteronyms, heterographs and homonyms. --Info/Types of Multiple Meaning Words (Pages 2-4) Includes definitions and examples of homonyms, heterographs and heteronyms, as well as a graphic organizer page to compare/contrast. 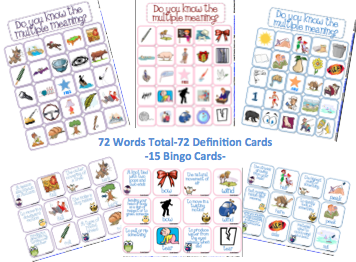 --Set #1 Homophones (Pages 5-15) Includes 24 homophone cards, 24 definition cards and 5 bingo cards. --Set #2 Heterographs (Pages 6-26) Includes 24 heterograph cards, 24 definition cards and 5 bingo cards. 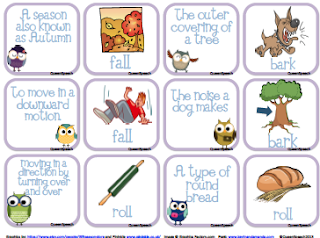 --Multiple Meaning Game Board (Page 38) Can your students state the two meanings for each word? --Multiple Meaning Review (Page 39) Students write 3 sentences, pick 2 more new multiple meaning words and draw 2 pictures. --Multiple Meaning Sort (Page 40) Mix up all 72 picture card and have your students sort them into each category! --Other Ideas: Play a matching game with the cards! Mix up all the pictures, place face down, have students take turns trying to match the two meanings for each word. I love the owls too ! I would use this packet to teach multiple meanings words and then to practice what they have learned through the games and activities in your packet. Your creativity is amazing. So much fun to learn with this. I love the graphics! 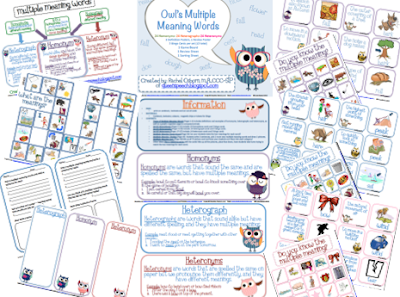 I would use the mm owls with my older students working on vocabulary! Leave a comment about how you would use my Owl's Onomatopoeias! I would use Owls' Onomatopeoeias for students on my case load that are on a modified curriculum. This is great material for inclusion on poetry units. Multiple meaning words are tricky for my students. I can't wait to try out this packet or activities. I would use this with my students in our mild cognitive impairment classroom. So many of my students have difficulty with these types of words. Cute owls! I would use this with my first, second and third graders who need something to increase their attention for the last six weeks of therapy.